For centuries, the word tea only referred to the leaves of the tea plant from Asia. In the last few decades, rising interest in herbal tisanes has risen and now these arcane sounding blends are more commonly called herbal teas. While you once had to seek out rare herb specialty shops to fulfill your medicinal tea needs, now you can find products including rose hip in grocery and drug stores. Learn all about this useful herbal drink product and how to use it safely and properly. As its name suggests, this product is made from rose hips. These are the small, bright red berries that form on almost all rose varieties after the flower blooms and dies away. The rose hip fills up with seeds and eventually dries into a seed pod, if it’s not eaten by a bird, small animal, or harvested by humans for tea. While you can use fresh rose hips to make juice and tea, the fruits are perishable and can’t handle being shipped to grocery stores. Almost all the tea products involving this ingredient rely on the dried version of the fruit, which is stable and quickly releases the condensed juices once rehydrated. The red liquid produced by steeping the dried and chopped rose hips in water features a sour and slightly sweet flavor. It’s reminiscent of green apples and barely ripe plums, along with faint floral hints of rose. Most people find it palatable when drank without sweetener, although a touch of sugar, agave nectar, or honey does bring out even more of the more complex flavor notes. The tangy and fruity flavor is why the fruit is commonly cooked down into jam as well. How Are Rosehips Grown And Harvested? There are specific types of roses, often called the dog or fruit roses, grown for their hips. The bushes bloom once a year and the hips are harvested after the petals fall off in the late summer or early fall. Harvesting at just the right time balances the amount of fruit and seeds for a strong flavor. The fruit are run through large scale choppers, spread on flat drying racks, and dried until hard and shelf stable. The roses that produce plentiful hips can be grown in a variety of climates around the world, so you can easily create your own rosehip drinks at home after a few years. 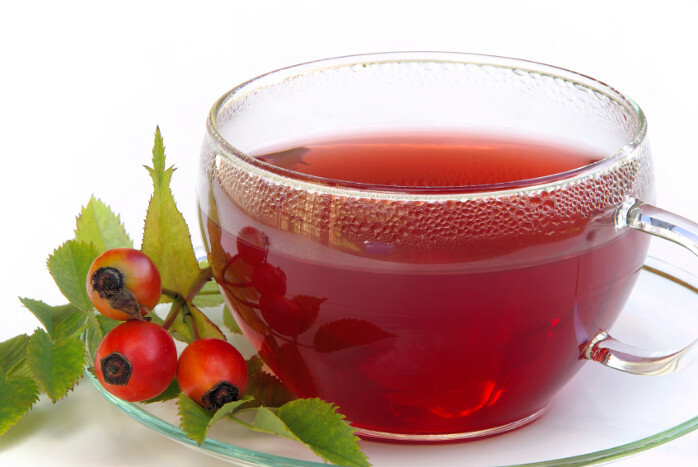 What Are The Uses And Benefits Of Rosehip Tea? First, rose hip tea is used for controlling the pain of osteoarthritis, and clinical studies have proven a reduction in both pain and stiffness in patients taking a formulated product twice a day. There is some evidence that rose hip may help obese people control their blood pressure and reduce cholesterol levels. Other uses include dealing with migraines, infections, colds, and fevers. Fresh rose hips have more Vitamin C than oranges, but the dried bits used for tea only offer a little of this important nutrient. The healthy acids in the fruit of the rose also offer a light laxative and diuretic effect without affecting your daily routine. Avoid rose hip products during pregnancy, as well as when breast feeding. Side effects include kidney stone development, excessive bleeding due to reduced clotting, and excessive iron absorption if you’re taking a supplement. How Do I Make Rosehip Tea? Once you’ve picked up tea bags from the grocery store or a bag of loose dried hips from the herb shop, you’re ready to learn how to make rosehip tea. For a hot cup of tea, heat up 8 ounces of water to just under a boil. Pour the water over the bag or packed tea ball, then let the herbal material steep for at least five minutes. Cover the cup during steeping to keep the valuable volatile oils and flavors from evaporating with the steam. 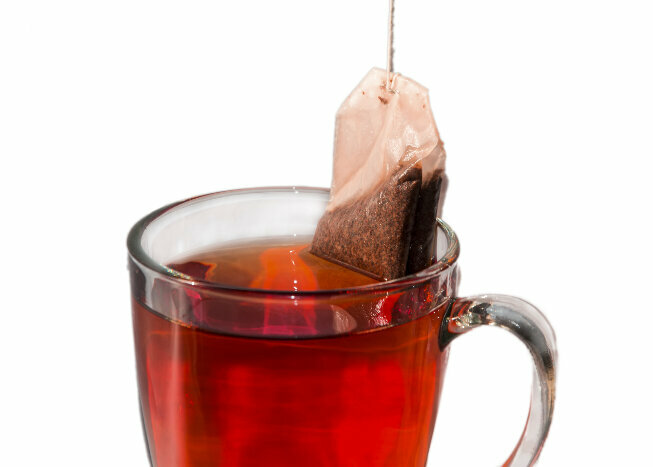 Make cold tea in a similar way, with one tea bag or one teaspoon of hips per eight ounces of water. After steeping, let the drink cool in the refrigerator or toss in some ice cubes and enjoy a refreshing alternative to soda. What Blends Well With Rosehips? Blackberry and raspberry leaves, two tasty herbs that further reinforce the medicinal qualities of the rose hip.